November 20, 2011 was posted on November 20th, 2011 at 7.32pm and is filed under Blog, Recipes. This entry has 3 comments. You can follow any responses through the RSS 2.0 Feed. I’ve been having a lot of fun cooking and baking in my new, big, bright kitchen, especially on days like today when I didn’t have to drive anywhere and I felt relatively energentic. Today I made Jason’s Tear and Share Cheese and Onion Loaf, which I saw him bake on the Great British Bake-Off. (We all LOVE the Great British Bake-Off!!!) It was one of the most delicious-looking things of the whole series and I’ve wanted to make it ever since. it’s a basic white bread dough, which you divide into 19 pieces. 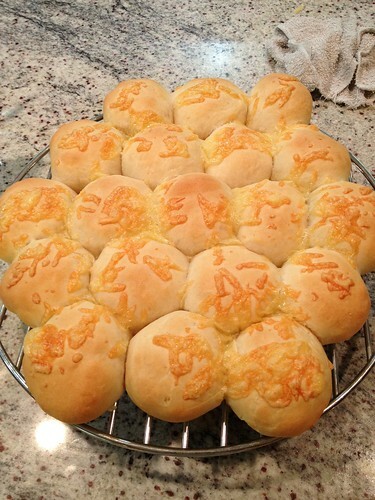 You flatten each piece, fill with a bit of sauteed onion and grated cheddar cheese, then seal each roll and place them on a baking sheet so they form one loaf. And then sprinkle with more cheese before baking. It was very time-consuming but not at all difficult; however, I never remember how long it takes to make bread, so I’ve always got the timing wrong and dinner is ready while the bread still has to rise one last time. Because of this poor timing, I didn’t let the loaf double in size before baking — I let it rise a bit but I was impatient to serve the lovely beef and veggie soup I’d made, so I went ahead and popped the bread in the oven early. Despite this, it turned out just beautiful — soft, flavorful, delicious! Wow! Everyone loved it. Thanks, Jason, for posting this fabulous recipe! Yay to big bright kitchens! The bread looks great. I’m so glad to finally be getting back into cooking myself. The last month of pregnancy I wasn’t doing it anymore, and the first month and a half or so after Elowen was born. That’s a couple months of no cooking! No fun.